The technique of having Multiple authors to manage a Blog is getting popular these days. Though this feature was already available in wordpress , recently Blogger too has enabled this feature. So now Blogger Users can have upto 100 multiple Authors or co-Authors for their blogs. So this new Team Blogging feature has enabled multiple authors to manage a single Blog. Although the owner of the blog will be the admin by default and all new authors he invites will be given co-author account. They can only EDIT their posts and they won’t have the feature to edit / delete others posts. However the admin can change the privileges of the co-authors anytime. In this tutorial , I will explain how to Add more co-authors or guest authors to your Blogger Blog. Just follow these simple steps to enable this feature in Blogger. 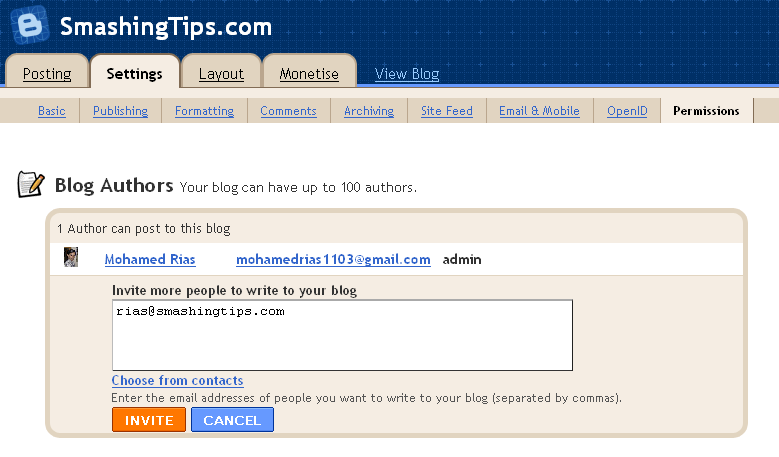 Click the “Add Authors” button to add one or more new authors to the list of people who can write posts for your blog. After adding the authors email id , click ” invite ” button. If you want anyone of the author to edit others post , then you need to grant him admin privileges. For granting Admin privileges , go to Settings page of your blog and navigate to Permissions subtab. Beside the author name you will see a button ” grant admin privileges “. Click that button and you are done. Now your partner can edit or delete any posts. But one thing you must be very careful before giving someone the admin privileges is that once you grant someone admin privileges he has the power to remove you from the blog. How can we customize the default ‘About Me’ widget for Multiple Authors with a thumbnail for each Authors. So if I invite someone they don’t have to have a Google or Blogger account prior to invitation? It’s not necessary that they must have one blogger account. Even if they don’t have one Blogger account, they will get your invitation later they need to create one account in blogger.com inorder to become a guest author. Hope the above info is useful to you.. check soon for other new hacks. After sending invite, the person who I send the invite to does not receive an email. I have tried two email addresses and neither of them work. Looked in spam and it is not their either. My roommate and I have a blogger blog together, and before I figured out how to add her as her own author on the site she published a couple posts under my name. Is there a way to go back and change those posts so that my roommate is the author and not me? Since the post is already published… the author name can’t be changed now. But if she (your friend ) wants to have those two posts under her name then you need to delete the posts temporarily and publish the posts again from her id. It’s the only way possible as of now dude..
Is there a way for the ogirinal commenter to get an e-mail notifying that their comment has been replied to? i want to know how to add blog multiple blog in single email-id . i give u situation i have 4 blog in email-id(A) and 4 blog in email-id(B). i want to know how to add email-id(B) blogs in email-id(A).plz help me. Its very easy buddy… just add email-id (A) as admin in email-ID (B) blogs.. and remove email-ID(B) from the admin option of the email-ID(B) blogs… hope this will help you.. i have did this before for my blogs..
1- do the Author guest will know my password of the blog?? 2- if “NO” should i open my account for her so she can add her post? 3- if “YES” so how can i protect my blog ???!! 1. No the Guest author won’t know your password. 2. You can invite her as author to post in your blog. Enter her email under author. 3. She can delete or edit only her posts. She can only write articles, she won’t have any control over your content or blogger template. So you can add her as author. At the same time, Don’t add her as admin. If you grant her admin privileges then she can take control of your blog. So just make her author , so your blog will be safe. How to create guest posts in blogger? Thanks very much for this. I was wanting to know how to do this for ages, as I share a blog with one of my friends. I know how to do it on Google Sites, but I couldn’t find the feature on Blogger. Thank you again. I am working on a Blog for our Genealogy group. I would like to have all members be able to write posts. Do they all need to have a gmail account? Not everyone does and I am concerned about the not to tecki members being able to contribute? Hi Claludia, Yes they need a gmail account. The invitation part and the confirming is not so difficult.. its very easy… I have seen blogs where around 5 members contributing to it. So this feature will surely fit your blog as well.. Thank u viya..It’s really a helpful post..Thank u very-much. no one is answering ran’s question, I need it too. 2. You can invite her as author to post in your blog. But, I wonder if new author or user could register and sign them up like in wordpress. could it be? No, Blogger doesn’t have that option still. Lets hope blogger will include this option in future updates..
Nice one, blogger is now improving, hope the do something about the current commenting system and to improve the mobile rendering as well. Thanks for the tutorial. I sent an invite to someone early this morning. And they accepted. The issue is, they are still not showing up in the authors section. They are still showing in the invitation sent section. My question is, how long does it usually take to show up correctly in the authors section after they accept? It’s amazing to see how Blogger is making a lot of changes to make blogger easier and better for its blogger. And that is one reason i love competition. WordPress has become a big competitor that Blogger can no longer ignore. So, they needed to step up the game!